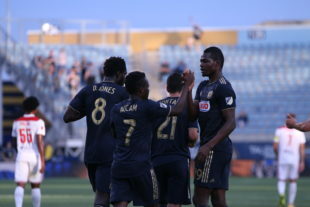 2018 was quite undoubtedly the year of Bethlehem Steel, both in the club’s own right and in the way that Steel alumni have molded the shape of this younger, new look Philadelphia Union roster. This past USL season, Bethlehem made the playoffs in historic fashion, finishing sixth in the Eastern Conference during the regular season with a team record 50 points and 14 wins. On top of their regular season success, coach Brendan Burke led his men to the first ever playoff win in club history, defeating in-state rivals Pittsburgh Riverhounds at their own building. It was an unprecedented season in the Lehigh Valley, one that will be remembered by the team and fans alike, but what does Steel’s success mean for Philadelphia Union? Over the previous three seasons, several Bethlehem players have made their way onto Jim Curtin’s Union roster, but none had particularly made any kind of lasting impact. In this past season that all changed, as a corps of players from Bethlehem made their way into the starting 11 and made a difference. Steel players made an instant impact on the Union roster when then-18-year-old Anthony Fontana got the start at the number 10 position ahead of the newly signed Borek Dockal and scored Philadelphia’s first goal of 2018 to help push them to a 2-0 win at home over New England. Also in that game was Cory Burke, a man that tallied a team high nine goals in a Steel uniform the season prior. Burke helped create the second goal of the night as he was credited with the assist on C.J. Sapong’s finish. Fontana’s unmistakeable talent is continually recognized by U.S. Youth Nationals Teams as well. In his most recent call-up to the U.S. U-20 team, Fontana bagged himself a hat-trick while also assisting a goal in their 6-0 rout over Saint Vincent in U-20 World Cup Qualifying. Fontana eventually gave way on the Union for Borek Dockal (understandably, as Dockal went on to lead MLS in assists), but with all of his talent and experience at such a young age, there’s no reason to doubt that Fontana will continue to make an impact for The Union. Other Steel players like Matt Real and Derrick Jones joined Fontana with a handful of appearances this season but were unable to step into greater roles with the team. Real made a few appearances for the injured Fabinho, but MLS proved to be too big of a stage for the outside back as he struggled in the few appearances he made. The Union’s left back position is in serious need of improvement, as Ray Gaddis became a liability down the stretch against good opposition. Expect Real to be back in the 11 eventually. Derrick Jones continually proves that he’s ready to take the next step and become a starter for the Union, but in a crowded midfield with talent galore, there just is not a spot for him. He will be the successor to Haris Medunjanin’s holding midfield role, the only question that remains is when. With Fontana, Jones, and Real being stored away for the future, the time was now for a pair of former Philadelphia Union Academy graduates and Bethlehem Steel products. Twenty year old Auston Trusty and 19 year old Mark McKenzie solidified themselves as the central defensive pairing of the future for this Philadelphia Union side that continues to get younger each and every season. Trusty signed his first team contract in 2016 but did not make his first team debut until March of this past year, starting in the 2-0 win over New England and contributing to a clean sheet on defense to start the campaign. Trusty went on to start 34 matches in the regular season for the Union, logging more minutes than any other player on the team as the only player to have played every minute of every game. The central defender from Media, PA became the youngest in the history of the league to ever play all 90 minutes in each regular season game for his club, proving his reliability at the position. Auston Trusty showed his youth and inexperience at times this season but ultimately showed more potential than anything, particularly in big matches. He was tasked with man marking some of the best that Major League Soccer has to offer, such as Zlatan Ibrahimovic, who Trusty managed to keep out of the match for the entire first half and most of the game. He will continue to grow and will be a staple in the lineup for years to come alongside his defensive partner Mark McKenzie. McKenzie, much like his fellow centerback, made his professional debut early in the 2018 season. Unlike Trusty, however, McKenzie’s appearance was not planned, but the 19 year old took his opportunity and ran with it. Jack Elliott had made all of the starts at centerback along side Trusty until the middle of April and was thought to be a sure thing as the starter. Despite back-to-back shutouts at home to begin the season, the Union defense became unraveled and Elliott struggled mightily in those games, opening the door for McKenzie to make his first start for Philadelphia on the road against Dallas. The Homegrown player went on to make 18 starts for the club, earned MLS Team of the Week honors twice this season and found himself on the shortlist for the MLS Rookie of the Year award. McKenzie is a little further behind in his development as a player than Auston Trusty, and it showed on the field later in the season, leaving some to question his place in the starting lineup for next year. Whether or not signing a more experienced defender to have start in his place would help him develop or not remains to be seen, but it is a realistic possibility and one that management will have to think long and hard about because McKenzie is not short on talent by any means. On the attacking end of the field, Jamaican striker Cory Burke was signed for one purpose and one purpose only: score goals. He did just that for Bethlehem. He has scored more times than any player in Steel history, so why was he not called into the Union starting 11 sooner? From the Union’s perspective, it was not an immediate need for the club. Until it was. C.J. Sapong scored a franchise record 16 goals in the 2017 campaign while adding another 5 assists. To begin 2018, Sapong just was not in the same kind of form as he was the season prior. The need for a replacement striker became real very quickly for the organization. In May, the Union rewarded Cory Burke with his first start for the first team and he paid the team right back, scoring what proved to be the game winner. Burke finished the season with a share for the team high with 10 goals, five of which were game-winning goals, on only 15 starts. He proved to be a revelation for the Union this season in a year that they desperately needed some inspiration up front. The 26 year old’s talent is still raw and unrefined, making him a high risk/high reward play going forward for the team. The fans still want a big name signing from Europe or South America to lead the attack from the striker’s position, but that, of course, is unlikely here in Chester, leaving Burke as the best option for the foreseeable future. The Union are just a few positions away from being a real contender and many of their needs can be filled by players they already have, players waiting for their time. It’s realistic to expect that by season’s end in 2019, five or six former Steel players consistently feature in the 18 the Union. That is truly something to be excited about.